Promoting your business in as many ways as possible for as little expense as possible is one of the keys to building a buzz around your business and attracting new customers. Not only that, but having a thriving social network that discusses upcoming events, new items and other happenings with your collectibles store can keep regular customers excited about the shop and hopefully persuade them to come in and spend their cash. Developing a community feeling to your business isn’t a difficult task and as a business promotion tool, social networking sites are perfect to achieve this objective. One of the fastest growing social networking sites over recent years is Facebook. It’s no longer just the social networking choice for teenagers, but is a thriving business promotion tool that most of your competitors will already be using. Facebook allows you to create your own business page that has information and news about your company, as well as events pages, video posts, forums, groups and more. One great aspect of Facebook is that it not only allows you to promote your business through the site itself, but actively encourages you to add buttons and links to other websites to show that you have a Facebook presence. This can bring in more customers than you’d usually be able to reach and developing a sense of community on there is fairly easy. With people on your friends list all receiving updates about each other as well as you, people can talk about collectibles, pose questions to you or others, arrange meetings, request items for stock and more. To do this takes a relatively short space of time, especially if you’re promoting your Facebook page with widgets and buttons elsewhere. Facebook also allow you to buy text and image ads that appear across certain target demographics of Facebook users. You can develop this with an expert Facebook operator, or set it up fairly easily yourself. This costs of course, and it’s very much a trial and error approach as you’ll have no real idea how many people will shop at your store because of it. The common perception of MySpace is that it’s a purely personal social networking site that should remain the realm of teenagers and young adults. As a collectibles business owner, you may be missing out on a lot of free business promotion and potential customers if you don’t tap into MySpace as a business tool. The customisation aspect of MySpace means that most people can create very personal sites that differentiate them from others. If you want to make an impact on there that speaks volumes about your business, design a layout that highlights some of your products, or even shows photos from inside your store. Adding a personal touch to a business site can make customers feel more welcomed and give them the impression that you’re approachable. You can use the ‘bulletin’ feature to mass mail everyone on your friends list letting them know about upcoming events or new items in stock. You can also keep lots of photos on there to show them what you have in stock and hopefully tempt them into your shop. As with Facebook, setting up a great profile page, or background information is handy on MySpace. Let people know what you’re all about and try to encourage group interaction by using the group forum posts to let them know about your collectibles. It’s also worthwhile to take time to leave comments on your friends pages and leave a link in there back to yours. This may get noticed by others and bring you in more visitors and thus more customers. 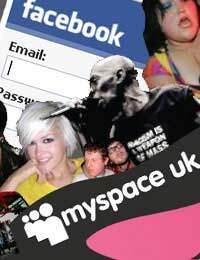 Although there are a variety of social networking sites available, MySpace and Facebook currently remain the ‘big two’. If you can cover more social networking sites then do so, but sometimes it’s better to maintain a thriving community on just a few rather than a substandard community on many. One other that may be worth considering is LinkedIn as it’s aimed more for professional networking and often has many older participants that may be there for business reasons. Always provide plenty of links to your website, especially if your site offers online shopping. Use keyword rich profiles so that you get picked up by search engines and try to add a little personality to your site, either through the writing or the layout. Use as many applications, widgets, buttons, videos, RSS feeds and more as you can. These will help promote your business with little effort from you and are a great marketing tool. If you can combine a variety of all these methods and the individual approaches for both MySpace and Facebook, you should see your business gather much more interest and hopefully this will help your profits soar.